As expected, Sheila Polk's final rebuttal was brilliant. Despite the nearly four hours she had available to her, she took only a couple... and managed to cover more ground than Luis Li did in over six. This is because Polk is a good public speaker, where Li -- and I say this as a former competitive public speaker -- is terrible. I have much to say about Polk's close but I find that even after two blog posts on the subject, Li's closing argument is still stuck in my craw. I'm actually a little amazed at how much it irritated me. And not just because it was six hours of my life I'll never get back. Upon consideration, I realize that it comes down this: Narcissists really push my buttons. That was one of the most self-indulgent speeches I've ever heard, and I'm including speeches that are intended to be autobiographical. The Salty Droid put together a great, little video of some of the lowlights. It really underscores the hypocrisy of Li's refrain, "But this isn't about me." Of course it was all about Li and I'm realizing that that has been an observable pattern throughout this trial. Listening to this, I noticed an aside that I'd previously missed. In his "anecdote" about mountain-climbing, he let slip that he was actually considering putting up a picture of himself climbing Mount McKinley. Truc Do talked him down. She wisely pointed out that to do so would be "cheesy." Gee. Ya think? The man was already drowning in giant, over-sized charts, easels, and the calendar that ate Manhattan, and he wanted to put up a picture of himself climbing a mountain. My guess? It probably would have been actual size. Who does that? Who, in the midst of a legal argument representing a client who is paying for his counsel, puts up a frigging self-portrait?!! Sadly, his self-indulgence continued today, into Sheila Polk's rebuttal. The objections started ten minutes in. By roughly the half hour mark he was already on the fourth and Polk finally called for a sidebar. Objections during closing arguments are rare. Their purpose is to put on the record grounds for appeal and, as we know, this defense team seems to think that nearly everything Sheila Polk says and does creates reversible error. I think there are really two things at play here and both are irritating. The first is that Li was using objections as part of a continuing attempt to filibuster; to stall for time, throw Polk off her game, and break her momentum. I think he just wanted the jury to be as bored and annoyed by her remarks as they undoubtedly were by his. That is grossly inappropriate during closing arguments. The second is that Luis Li is absolutely convinced of his own correctness. A clue to that was in his criticism of Michael Hamilton for having his own sense of spiritual truth. As I said before, I find the idea of "objective reality" troubling. But I think he really believes that there is some objective truth... and that he possesses it. It's a strange position for a man who can split a hair as finely as Luis Li. The subtle legal points he makes are not matters of perception or opinion in his world view. They're not debatable. They are matters of fact. Li can take any subtle reading of the law and pronounce it with a self-righteousness usually reserved for holy writ. And when Judge Darrow, himself, disagrees with him, he starts lecturing Judge Darrow. If Sheila Polk interprets the evidence differently than Li does, she's objectively wrong, it's reversible error, and probably constitutes prosecutorial misconduct. So she was unable to get through her rebuttal without numerous objections and several of sidebars. I don't think there were anymore mistrial motions but, in fairness, I really don't know what was said up at the bench. Even through all that, Polk was brilliant. She again allowed Ray's own words to illustrate his guilt. She interwove segments of his pre-lodge description with the known symptoms of heat related illness, demonstrating the clear correlation. She explained how that circumstantial evidence -- the description of the superheated environment participant were in -- pointed to heatstroke as the cause of illness and death in the sweat lodge. She then explained that once a person has slipped into unconsciousness, they need to be removed from the heat promptly and cooled or their organs begin to fail. Polk addressed the issue of the lack of a documented high temperature of 105° that would have convinced the defense's medical expert Dr. Paul that it was heatstroke. She pointed out, again, that in the handful of heatstroke findings in his own career as a medical examiner, he had no documented core temperature. She explained that getting that temperature on the record is not the first priority of doctors dealing with heatstroke patients. Cooling them and saving their lives is. And in the case of the sweat lodge aftermath, people were cooled by hoses, buckets, and the cool air of the October evening. As she has done throughout her commentary, Polk used the testimony of witnesses to both illustrate and humanize the factual elements of her case. The defense tried to cast doubt that Liz was hot when she came out of the tent by arguing to you that Dr. Nell Wagoner, the gynecologist from Alaska, had testified that she touched Liz immediately, right after she emerged from the sweat lodge and that she was cold.... It is simply not what the witness, Dr. Wagoner, testified to. She did not testify that she immediately went to Liz and touched her and that she was cold. Here's what Dr. Wagoner testified to. She testified that when this heat event was over she saw four people unconscious in the tent. She told you that she tried to drag a woman out but could not. And she told you that she then assisted in dragging another woman out who was also unconscious and pulled that woman straight out the entrance and left her there. And, by the way, remember that Dr. Wagoner testified to her shock at how much hotter the back part of that sweat lodge was as she circled and tried to pull people out. Dr. Wagoner testified that once she was outside, she put the unconscious woman down and turned to the Dream Team members and said there are people unconscious. They can't get out and they need help. Dr. Wagoner described for you how hot and weak she felt, how she laid down in the field about twenty feet from the tent and that someone poured water on her from a container. Dr, Wagoner told you that with the cooler air temperature and that water she, Dr. Wagoner, cooled down quickly and began to feel chilly. 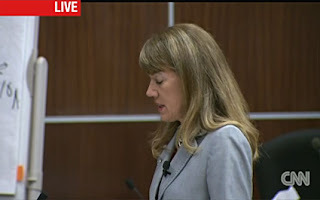 Dr. Wagoner testified that at some point she tried to get up and someone told her to stay down and not to get up yet. She told you that somebody else brought her electrolytes to drink. And then Dr. Wagoner told you, then when she was finally ready to get up, someone told her to go to her room. But at that point she looked around and saw people in distress. That's when Dr. Wagoner testified she saw Liz lying there, close to the tent, with no one tending to her. Dr. Wagoner told you Liz was breathing but would not respond. And finally Dr. Wagoner told you that when she touched Liz her skin was cold. Dr. Wagoner told you that Liz had been hosed down and Dr. Wagoner told you that she was with Liz, she thinks for about thirty minutes before the paramedics arrived. With this recollection of Dr. Wagoner's comments, Polk established a number of things: that Liz Neuman was wetted down, that it was hotter at the back of the tent, that many people -- including Liz Neuman -- were unconscious and not being properly attended to, that people had plenty of time to cool and lower their body temperature even before the paramedics arrived, and that Luis Li was blatantly misrepresenting testimony in his closing argument. Polk also took aim at Dr. Paul's claim that dehydration is not part of the diagnostic criteria for heatstroke in any of the medical literature that he, himself, provided. She spent a good deal of time comparing the two paid experts and Dr. Paul and Dr. Dickson and took the opportunity to explain why the State had hired an expert. This was to address Li's assertion that the State didn't need to hire anyone when their own, government employed experts available to testify. They hired Dr. Dickson, she explained, because the wanted someone to look at all the evidence and form an overview, rather than simply presenting different doctors and Medical Examiners to testify to different cases. She made the point that Dr. Dickson, because he worked in the extremely hot town of Yuma with all it's industrial farming, was uniquely qualified to speak to both heatstroke and organophosphate poisoning, having treated both. Again, Dr. Dickson was the only medical expert who testified in this case who had actually treated organophosphate exposure. Dr. Paul, on the other hand, being from New Mexico, had seen only 10-12 instances of heat related death, and zero cases of organophosphate poisoning. Polk walked the jury through how toxidromes were considered and eliminated by the treating physicians and why that rendered the background noise recording of the "EMT" irrelevant. It was speculative and preliminary -- exactly the kind of evidence the defense wants to cherry-pick in this case. But doctors go through a series of eliminations to get to final conclusions and one of the things that was eliminated early on was cholinergic poisons like organophosphates. Also eliminated were anti-cholinergics. Those determinations were made based on the clinical data and, therefore, no bloodwork or other testing was required to eliminate them. Carbon monoxide was not ruled out clinically, so blood was tested and came back with normal levels of carbon monoxide. She also pointed out that even if there had been a sign of an organophosphate-like toxidrome, Goldfrank's Toxicologic Emergencies referred to by Do and and by Dr. Paul explains that there is no really good blood test for them. 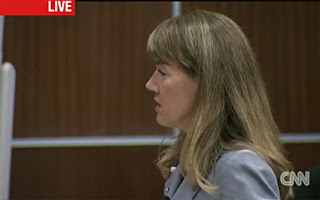 She also pointed out that the defense's claim that the State had not kept blood samples for testing was flat-out wrong. Those samples were preserved and available to the defense had they chosen to run tests, which they did not. Dr. Paul, Polk reminded the jury, did not even include the organophosphate theory in his report. It only came up near the beginning of the trial and the State immediately acted to get testing done and when they learned those tests couldn't be counted on, the immediately informed the defense of that as well. In what was easily my favorite moment in her discussion of Dr. Paul and the organophosphate theory, she invoked Do's "outlier" comments to Dr. Dickson. This is not fifth grade. This is not medicine by peer pressure. Having eviscerated the organophosphate, "look-away" defense strategy, Polk returned to the extreme heat as the cause of death. 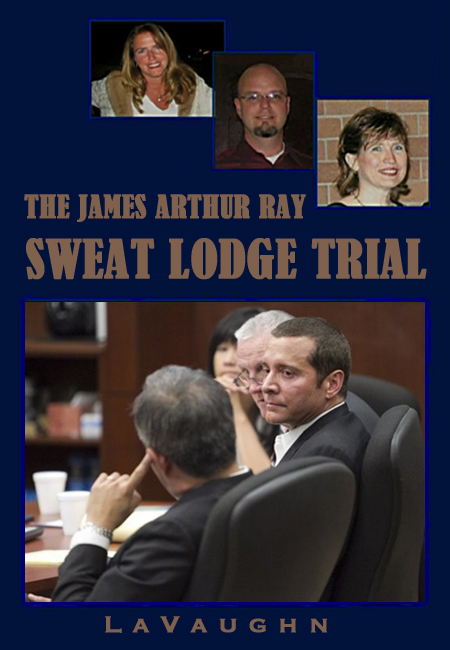 She reminded the jury that they'd heard testimony demonstrating that it was only at James Ray's sweat lodge ceremonies that illness occurred. This was true no matter what structure was used. Other sweat lodges were conducted at Angel Valley in the same structures and there were no reports of illness. Polk discussed Jennifer Hayley's testimony that she didn't feel her dreams would come true because she hadn't been able to endure those temperatures for the duration of the sweat lodge. And she recalled Beverley Bunn's testimony that she believed Ray, with all his experience, knew better than she how much heat she could endure when he intimidated her out of leaving the sweat lodge. She described Melinda Martin's horror from the very first round at what was unfolding. Those who had been acculturated to Ray's way of doing things actively discouraged her from showing her distress, telling her to wipe that look off her face. But Martin set about trying to help the people as they left the tent early on, some collapsing from the heat. She recalled Dennis Mehravar's screams that he was dying and Ray's assurances that he was not. Less than hour later, she pointed out, two people were dead. She described testimony about someone named who Carlos who nearly staggered into the rock pit but was stopped by other participants. Lou Caci, of course, was not so lucky. Polk addressed directly a number of Li's false assertions about the prosecution. "I never thought I would find myself having to defend the fact that I'm a working county attorney, so I'm just gonna leave that one alone," she said. From there she moved to the "secret meeting" and she did a decent job of demystifying the State's position and explaining that the defense had received all of the information from that meeting. There was an objection and another sidebar which muddied the water a bit on that but at least she was able to address it with some degree of frankness. She reminded the jury that life is not an episode of CSI and that, while Det. Diskin had not talked with Dawn Sy about her lab results, he had talked to her boss. She also reminded them that, far from avoiding Sy's testimony, they'd had her in the hall at one point waiting to testify for the State. You never heard the State talk about cults. This is not a case about cults. This is a case about a man, James Ray, who marketed himself as a qualified professional who charged $10,000 for a five day event, not including room and board, and then recklessly caused the deaths of the participants who trusted he knew what he was doing. And who reasonably relied on him to keep them safe. In the course of her rebuttal, Polk reminded the jury of numerous opportunities Ray had to be a responsible professional running an event and how he squandered them all. From early on when Ami Grimes was dragged unconscious from the tent he could have stopped the event to address the impact on people's health. He could have stopped to check when Megan Fredrickson reminded him that he was responsible for the people in the tent. Instead he continued on as someone rolled under the wall of the tent to escape the heat, stopping only to warn people that it was sacriligious. Through all the expressed concerns about people in distress, people passed out, people not breathing, Ray kept going, never stopping to check for himself and determine whether people were actually in peril. He checked neither the people who had left, nor those who were still inside the tent. Death was not inevitable. And this was not an accident. Mr. Ray had so many opportunities to change the course of his conduct but he did not. And that is why we are here. But for Mr. Ray's conduct the victims would not be dead. Polk also addressed Li's outrageous assertion that it was inappropriate for her to have shown the pictures of the three decedents because it was playing to the "sympathy and prejudice" of the jury to talk about the lives that were lost and of their dreams that would never come to pass. In the video above, you can hear him describe his outrage over this even as he proceeds to paint James Ray as the victim in the most dramatic and emotive of terms. "He has a name," said Li, erroneously implying that the prosecutors only referred to him as "the defendant." Yet Li could not bring himself to name Kirby Brown, James Shore, or Liz Neuman. He could only decry the use of their images by prosecutors. 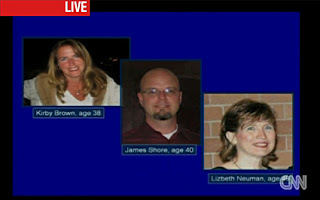 Mr. Li said it was "wrong" for me to leave up photographs of these three victims, when I did my first closing. We are here because three people died needlessly in Mr. Ray's horrific heat endurance challenge. We are here because Mr. Ray recklessly caused their deaths. And, yes, I am going to remind you of why we are here. These three people, looking to improve their lives trusted that for $10,000 Mr. Ray knew what he was doing. And they trusted that for $10,000, Mr. Ray would keep him safe, keep them safe, in his sweat lodge event. These three people lay in severe distress in Mr. Ray's sweat lodge while others around them tried to do what they could do to help, while others around them called out to Mr. Ray that they needed help and they needed to get out. These three people lay in Mr. Ray's sweat lodge dying while he continued to add more rocks, more water, and more steam. These three people are the reasons we are here. We are here because but for Mr. Ray's conduct these three individuals, Kirby Brown, James Shore, and Liz Neuman would still be alive. What's "wrong" in this case is charging $10,000, telling participants you know what you're doing, telling participants to trust you, and to set aside their own self-preservation instincts and then recklessly, incredibly recklessly, holding this ultimate challenge, this heat event, and in spite of information that people are in distress, unconscious, not breathing, need to get out, continuing to act, continuing to create more of that searing heat and more of that searing steam. That's what's wrong with this case. Mr. Ray's conduct, continuing to introduce that lethal heat with three people down and in distress with his knowledge. We are here ladies and gentlemen because Mr. Ray, because of his conduct. We are here because Mr. Ray intentionally used heat to create this altered mental status and was criminally reckless about the consequences. That is what reckless manslaughter is about. And I ask you again to find the defendant Mr. Ray guilty of all three counts. Thank-you. 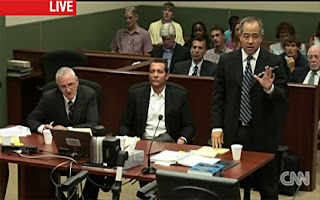 Watching the short compilation of Li's closing arguments was extremely painful. I can understand how listening to it in its entirety would be almost unbearable. Thank you for enduring so you can bring us these great recaps. So grateful you've been able to keep up with the trial despite the lack of consistent coverage by CNN. You've done a fantastic job! I just finished watching the video clip on Salty Droid, of Sheila Polk's last closing argument. In it, she mentions that during the event (? a few hours before), the participants had to write their own obituaries. Was this ever brought into the trial? Especially the ones written by those that had died? You have done a great job posting your comments on this terrible tradegy. Nobody wins here. I know James well and feel he did not have the intent of anyone dying at his event however, he was also negligent in allowing to happen what happened. May GOD provide some peace of mind to those affected. Updates: A couple of things have come up and I'll just stick them here. As per Tom McFeeley, the defense has, quite predictably, filed another mistrial motion based on Polk's closing. I'm not sure what that brings the total of mistrial motions to. For its part, the jury is deliberating and has called for a full list of exhibits. The mistrial motion has been posted. Read it and weep. @ Kathy Graham: Yes. The writing of obituaries was one of many writing exercises and was part of Ray's death theme... or fixation depending on your point of view. The stated purpose was to take some inventory of your life and determine if you were living fully. It's not an original idea or even a bad one. But in context, all those death metaphors are cumulatively creepy. This just in: Guilty, guilty, guilty! Three counts of criminally negligent homicide. I'll be posting details directly.